What do freelance copywriters charge? Copywriters’ rates vary, depending on the writer’s experience, location, portfolio, confidence and chutzpah. The recent survey by The Professional Copywriters’ Network asked 500+ copywriters about their work and earnings. 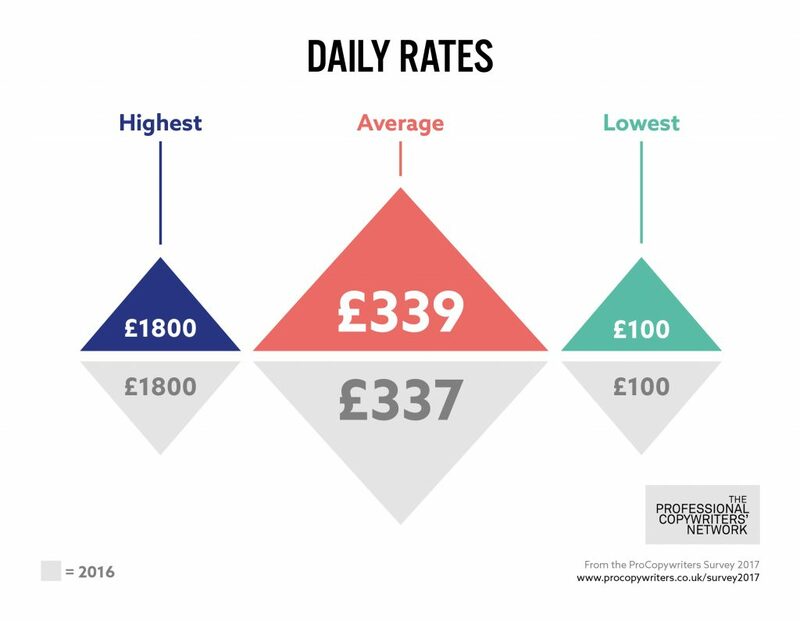 As you can see from the graphic, there is a huge range of day rates being charged, but the average of £339 is in line with last year’s average of £337. If you’re looking for a copywriter, remember that you generally get what you pay for. Of course, there are some great copywriters out there under-charging for what they offer, but most copywriters charging low rates are low-skilled – and may not treat their work with the same degree of professionalism that you could expect from someone charging £450. If your project is worth doing properly, it’s worth paying a fair rate for an experienced professional who will make your life easier. You should read the full copywriting survey from the Professional Copywriters’ Network.